The Ottawa-based architect firm, Jane Thompson Architect, deliver a wide range of projects ranging from residential projects like home additions and renovations to commercial and institutional projects. 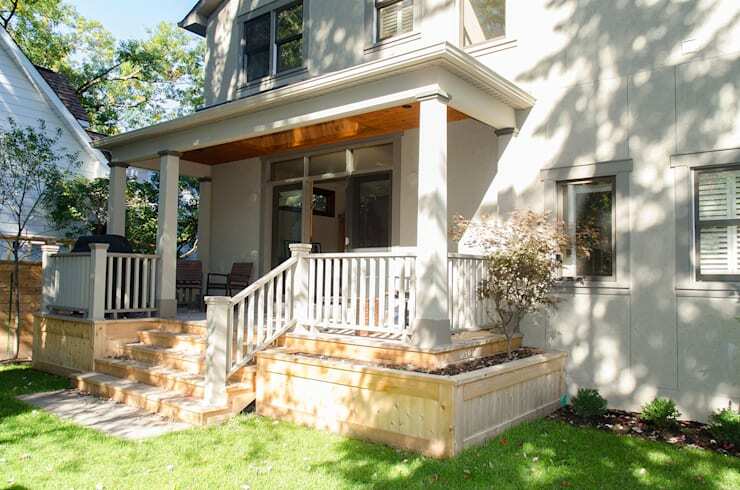 In this feature, you'll explore the result of a home addition which brought both a car port and and a front porch to the exterior of an existing neighbourhood home in Westboro. Like all of the projects from these architects, this addition was created to enhance the built environment – the existing home and neighbourhood – as well as the natural environment, like the front lawn, trees, and more subtle elements such as light and air. Both of these structures have an additional focus on livability, as they are both examples of highly functional home features that improve the residents' lifestyle by making it more convenient to enjoy the outdoors, park and access their car, etc. As you'll discover, although these additions are placed on distinct sides of the home, they share a common theme that creates a homogeneous, intentionally shared look. The tour begins with a view from inside the car port, which has been cleverly illuminated through the addition of two skylights that allow the space to enjoy an ample amount of natural lighting. Clad entirely in wood (with the exception of the glass used for the window panes), the structure takes on a homogenous, simple appearance, betraying a relatively complex construction. 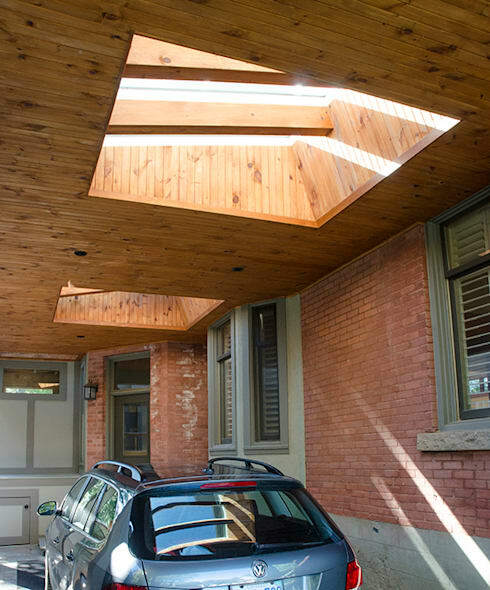 Note how the architects have worked with a high degree of detail, as the carport's ceiling has been carefully installed to conform to every edge and corner of the existing brick structure, leaving the original building almost completely undisturbed. Along the same vein, the architects have also considered the colour of their chosen material quite carefully, as the reddish hues in the wood sing in harmony with the red of the brick home. The other addition to the home is found in the front yard, where the architects have added a porch that balances a stately aesthetic with a traditional, friendly look. White has been selected to match the facade of the home, while a light wood brings a natural hue to the porch base. The addition of a raised planter hints that these residents place value in having interesting plants at their doorstep, the raised bed design providing opportunities for accessible gardening. Another angle reveals a common theme between the porch and car port additions, as you find the same reddish-hued wood cladding, as well as the skylight feature. 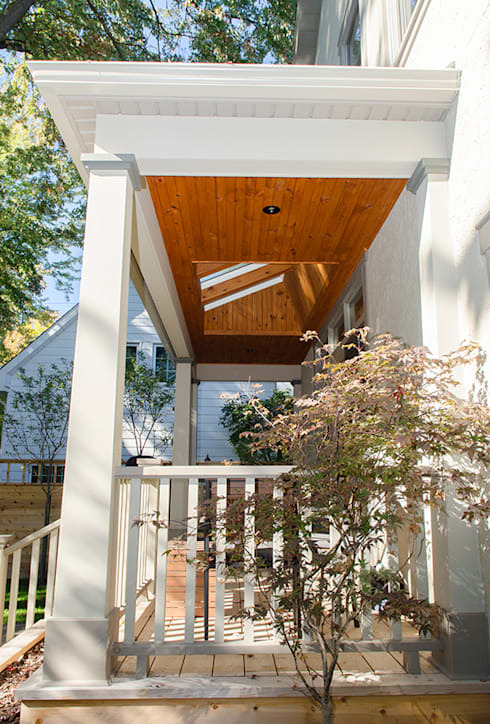 This porch receives a fair amount of shade from surrounding trees, so the skylight on the porch ceiling prevents the porch from becoming too cool and shady. This feature also allows the residents to enjoy a view of the lush tree canopy from the calming comfort of a rocking chair! Contemplating a home addition or building a mortgage helper? This coach home should inspire you. What's your opinion of these home addition ideas? Comment below!